Teach young children how firefighters protect people from fire with the Firefighters are Community Helpers Box! On your next visit to a Preschool, Kindergarten, or First Grade classroom, introduce firefighters as community helpers who work hard to keep people safe. 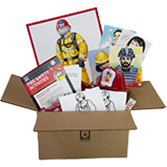 NFPA®'s new Firefighters are Community Helpers Box provides fire-safety activities that engage young children in understanding their world, while decreasing apprehension of firefighters in turnout gear and encouraging cooperation during life-saving fire rescue incidents. One grab-'n-go box has everything you need -- including teaching points, background information, activities, and fun handouts kids will absolutely love. You'll be ready to present firefighters as a positive influence in every community where children live, work, and play. A step-by-step Facilitator's Guide comes with teaching tools: a Firefighter Poster showing full turnout gear, a matching game with Community Helper Posters and job cards printed on heavy card stock, and a link for educators to visit sparkyschoolhouse.org to show the "Firefighters Are On Their Way" music video. Tear-off Firefighter Coloring Pads, Sparky® Crayons, new Sparky Adhesive Bandages, and Sparky the Fire Dog® Fire Hats support concepts while adding to the fun! Use the Firefighters are Community Helpers Box by itself for unforgettable classroom visits, or to enhance NFPA's free Learn Not to Burn® program (sparkyschoolhouse.org). Available in quantities of 30, 60, and 90.